The Advanced Manufacturing Research Centre (AMRC), a part of the High Value Manufacturing Catapult network, is working on a research project to enable robots to accurately machine holes in composite aircraft components, has matured into a production system and is on track to save BAE Systems millions of pounds in capital and operational costs over the coming years. The robotic countersinking technology was developed through collaborative research, led by the AMRC and involving KUKA Systems UK. The development technology derisked the process enabling the design of a production system. This production system has now been installed at BAE Systems in the UK, where it will be used to processes a wide range of composite components for military aircraft. Ben Morgan, head of the AMRC’s Integrated Manufacturing Group, said: “We have been able to develop a cost-effective solution with the latest state of the art control systems. The robotic countersinking technology includes the use of multiple robots to automatically handle composite components and then countersink high tolerance pre-drilled fastener holes. Non-contact metrology integrated with the machining robot locates predrilled holes and corrects the robot’s position before countersinking. 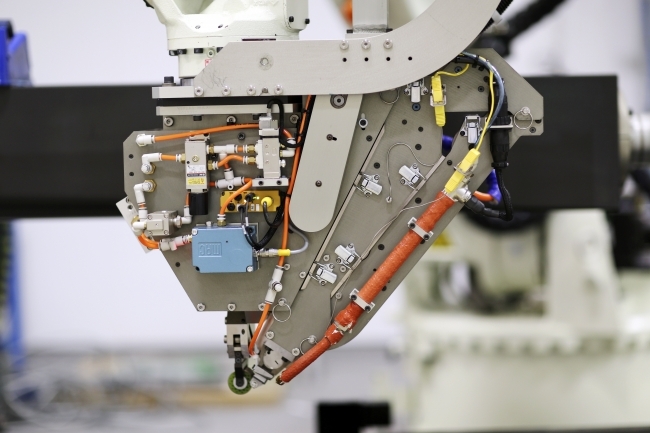 A separate robot provides support to the component eliminating expensive holding fixtures. The system is controlled via the latest S7 Siemens programmable login controller (PLC) and includes the use of augmented reality to aid component fixturing. Austin Cook, from BAE Systems, added: “Since we began working with the AMRC in 2006 it has supported the development of key manufacturing technologies ranging from high performance titanium machining to advanced automation for military components.